Luton caretaker boss Andy Awford has urged his side to take the attack to Portsmouth at Fratton Park this afternoon. 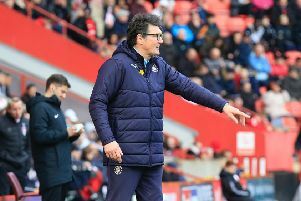 During Hatters’ 2-0 defeat against Wycombe on Boxing Day, the hosts failed to register even a single attempt on target, something Awford knows was nowhere near good enough. He said: “We need to do better, that will be the message going into the Portsmouth game, we’ve got to do better as an attacking unit. “Sean Long looked our biggest attacking threat down the right hand side, when your full back is the most attacking threat that’s not quite right for me. “He’s put in three or four crosses they’ve defended very, very well for me and that’s what Wycombe do, but we need to do a lot better with the ball and cause teams a lot more problems. “We weren’t fluent enough, didn’t test their goalkeeper enough, didn’t work him enough, although I can’t remember (Mark) Tyler flying across the goal and making loads of saves either. Awford is hoping his side can put the Wycombe reverse, their fifth in sixth games, behind them quickly ahead of a mouthwatering clash as he continued: “I said to the players, be disappointed tonight, but when we turn in tomorrow, that’s gone now, we can’t do anything about what’s happened. “We can’t affect that, but we can affect the next match. We have to be positive, come in and do the work and get down there. Striker Craig Mackail-Smith is aware his side need to make sure they are hard to beat first and foremost, as he added: “Hopefully we can stay in the game, keep them as quiet as possible. “Some of the boys will love it, some might hate it, playing in front of big crowds, it does different things.